The NITF (National Imagery Transmission Format Standard) format is commonly used for georeferenced imagery and has the ability to store a large amount of ancillary data and metadata along with the image itself, all in one file. One of the more useful pieces of ancillary data optionally stored within an NITF file is known as RPCs (Rational Polynomial Coefficients). With the use of RPCs and elevation data for the area, complete orthorectification is possible. For example data, see CAST’s “Corona Atlas of the Middle East” and choose from the large number of NITF files available for download. 1. 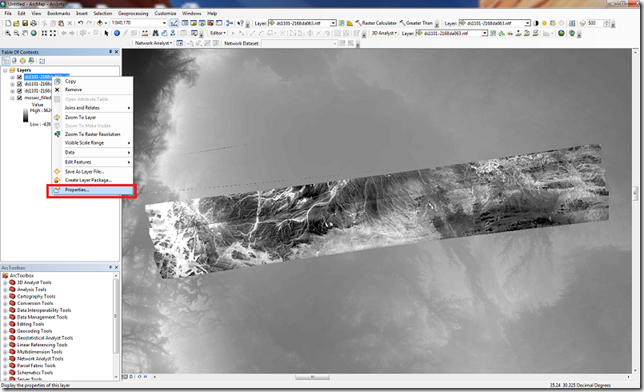 Open ArcMap and add one or more NITF image files. 2. Add a DEM covering the area. 3. Right-click the image name in the Table of Contents and choose Properties. 1. Check “Orthorectification using elevation”. 2. Click radio button for “DEM” and use the drop-down menu to choose the appropriate DEM. 3. Make sure “Geoid” is unchecked. 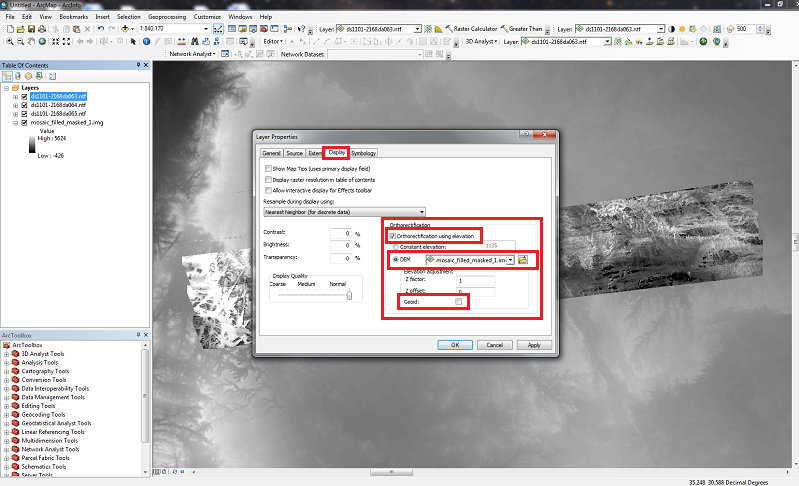 These Layer Properties will need to be set for each NITF file you add to ArcMap. 1. Use the “Export Data” dialog found by right-clicking the NITF file’s name in the Table of Contents, holding the mouse over “Data” in the context menu, and clicking “Export Data”. Options for extent, spatial reference, cell size, file location, name and format are available in this dialog. Choose the desired settings and export. 2. Use the “Create Orthorecitified Dataset” tool in the ArcToolbox. See the ArcGIS help for help with this tool. Please cite this document as: Barnes, Adam. 2011. 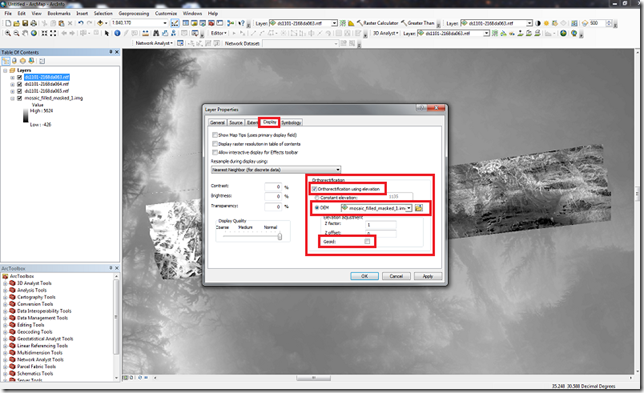 On-the-fly and Permanent Orthorectification of NITF Images in ArcGIS.CAST Technical Publications Series. Number 7340. http://gmv.cast.uark.edu/gisrs/software-remotesensing/arcgis/workflow-arcgis/on-the-fly-and-permanent-orthorectification-of-nitf-images-in-arcmap-2/. [Date accessed: 22 April 2019]. [Last Updated: 22 March 2018]. Disclaimer: All logos and trademarks remain the property of their respective owners.